MODESTO, Calif. (CNS) — There was a time when Janny Castillo wondered if she’d ever find a home for her kids. For nine years in the 1980s and ’90s, Castillo was homeless and carted her four kids from shelter to motel to home of a family member to shelter, making sure they didn’t miss school and they had enough to eat. It was not the most stable of lives, she admitted. Life eventually improved and today, Castillo, 54, finds herself advocating for homeless and at-risk older adults as program coordinator of Seniors Advocate for Hope and Justice at St. Mary’s Center, a program of the Diocese of Oakland, California. Castillo brought her skills, experiences and enthusiasm to see what she could learn from hundreds of advocates from 12 countries at the U.S. Regional Meeting of Popular Movements in California’s fertile Central Valley. She said she was pleased to learn about the breadth of faith-based advocacy for people in need and would return to Oakland with a notebook full of ideas from the connections she made among the more than 600 people on hand. Not all of the organizations represented at the meeting were Catholic, nor even Christian, but nearly all of them had a faith connection. 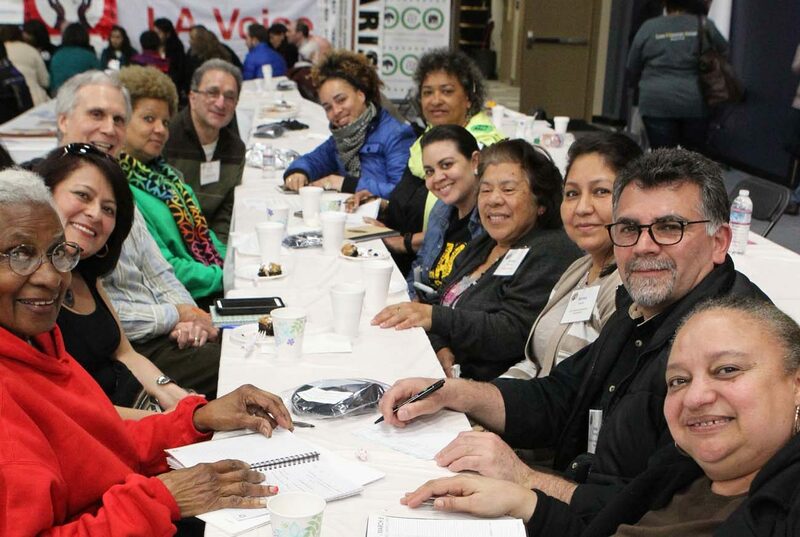 Many of the represented groups receive funds through the U.S. bishops’ Catholic Campaign for Human Development or are connected to the PICO National Network, founded in 1972 by Jesuit Father John Baumann, who learned the ins and outs of community organizing in Chicago. Father Baumann was on hand for the meeting and told CNS it was satisfying to see hundreds of advocates, organizers, labor leaders, Protestant clergy, Catholic priests and bishops, and women religious sharing strategies to become better advocates for people whose voices are often overlooked by government policymakers and corporate officials. David Gray, 44, a parishioner at St. Matthew the Apostle Church in Gahanna, Ohio, and a staff member of Accompanying Returning Citizens With Hope Ministry of the Society of St. Vincent de Paul in the Diocese of Columbus, was among those whose said his views expanded during the meeting. Such an understanding of “encounter” is what Pope Francis envisioned when he proposed the first World Meeting of Popular Movements in Rome in 2014. Two other gatherings — in Bolivia in 2015 and in Rome again in November — preceded the U.S. regional meeting. Planning for the meeting took more than a year. The Vatican’s Dicastery for Promoting the Integral Human Development worked with the U.S. Conference of Catholic Bishops, CCHD and PICO to maintain the focus on grass-roots communities to look at people’s concerns related to land, labor and housing. Immigration and racism were added as topics to address concerns particular to the U.S.
Kim Dunn, a leader with Together Baton Rouge in Louisiana and a member of the city’s St. Paul the Apostle Parish, left Modesto with newfound hope that people will work together to diminish fear of economic uncertainty, end racism and welcome immigrants. Meeting planners also made sure to include a wide cross section of young people involved in advocacy work. Young organizers, such as Johana Bencomo, an organizer with Comunidades en Accion y de Fe (Communities in Action and Faith) in Las Cruces, New Mexico, led small group discussions, introduced plenary sessions and were vocal in calling on faith communities to be a prophetic voice in response to human needs. Their deepest concerns arose during reports from small-group sessions. Repeatedly, young people urged Catholic clergy, including bishops, to be out front — at the pulpit and in the streets — in addressing racism, immigrant rights and economic inequality. “The confidence I’m hearing from our church leaders, the affirmation of our work, is really important. What I noticed, this is a movement. The grass-roots groups are in line with Pope Francis,” said Sister Tracey Horan, 29, an organizer with Indianapolis Congregation Action Network and a member of the Sisters of Providence of Saint Mary-of-the-Woods in South Bend, Indiana. I am writing in support of Tracey Horan’s comments and ministry. I would also like to make the correction stating that Saint Mary-of-the-Woods is in Saint Mary-of-the-Woods as we have our own post office. SMW is 6 miles northwest of Terre Haute, IN.